Our forums aren’t the most active at times but there’s a dedicated bunch who do frequent them. A number of them commented in our (still open) Reader Survey that they’d like to see local server forums – and that’s what we’ve done. 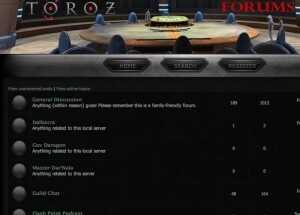 There’s a forum for each of the three local servers and we’ll obviously add new forums once other servers come on line. They’re looking pretty bare at the moment and the only thing that’ll fix that is you – so jump on in if you have the time!